Web-only retailers in the 2014 Top 500 led all merchant types with 21% sales growth, but can they keep their edge? 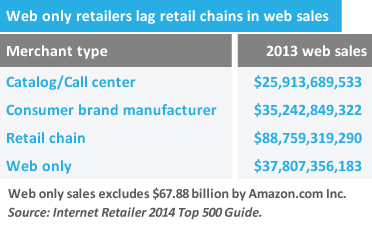 Excluding Amazon, web-only retailers’ 2013 web sales were $37.81 billion, up 22.3% from $30.91 billion in 2012. Web-only retailers like Quantum Networks LLC succeed by being different. When the retailer of cell phone signal boosters, video surveillance equipment and custom servers launched in 2008, its specialized products were not well-known, says Eytan Wiener, chief operating officer. To promote the products on its web site, the company emphasized technical support, he says. Differentiating itself is how Quantum, No. 480 in Internet Retailer’s newly published 2014 Top 500 Guide, grew web sales on Quantum-Wireless.com by 109.7% in 2013, to $23.7 million from $11.3 million in 2012. Volume sales to government agencies and corporations, expanded product choices, higher-margin products, selling on web marketplaces such as the one operated by Amazon.com Inc. and using search marketing, including pay-per-click and organic,all contributed to 2013 web sales growth, Wiener says. Quantum is one of the fastest-growing web-only retailers in the 2014 Top 500 Guide. As a group, the 197 online-only retailers in this year’s Top 500 racked up $105.72 billion in web sales, a 21.1% increase from $87.32 billion in web sales by 195 retailers in that category in 2012. Most of those sales came from Amazon.com (No. 1), which posted online sales of $67.88 billion in 2013, a 20.3% increase from $56.41 billion in 2012. Excluding Amazon, web-only retailers’ 2013 web sales were $37.81 billion, up 22.3% from $30.91 billion in 2012. An analysis of Top 500 data shows that web-only retailers, minus Amazon, surpassed cataloger web sales of $25.91 billion by about 46.0%, but their total web sales without Amazon barely exceeded those of consumer brand manufacturers’ 2013 web sales of $35.24 billion and fell far short of chain retailer web sales of $88.76 billion. The question for all web-only retailers is: Can they sustain strong growth in the face of increasingly stronger online competition? That will be difficult, says Sucharita Mulpuru, vice president and principal analyst, e-business, at research firm Forrester Research Inc.
Retail chains in particular are trying to leverage their physical stores to offer greater convenience to consumers, such as by allowing them to buy online and pick up in store. The absence of a physical presence hurts web-only retailers, Mulpuru says. For an online-only retailer like Quantum, sustaining such a stout growth rate isn’t likely, Wiener says, partly because of limited scalability and manpower. But Quantum plans to keep growing web sales. It is expanding international sales by taking on sales for smaller manufacturers without the means to reach overseas markets, upgrading its web site so it loads faster and allows faster checkout, and adding Amazon Payments to payment options that include PayPal for global shoppers, Wiener says. Over time, online-only retailers could face a hard choice between selling commodity products at low margins or products that are hard to find in stores, as other merchant types, especially chain retailers, perfect their multichannel strategies, says Penny Gillespie, e-commerce research director at research and advisory firm Gartner Inc.
“It is possible for some commodity items to be available only via the Internet, especially if they can be set up for automated reorder upon consumption or life-end, because people no longer feel compelled to touch them or try them,” Gillespie says. She adds that online retailers can still compete if their products or services fill a niche. 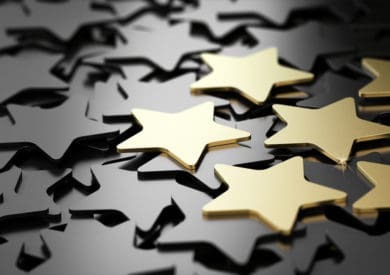 For its part, Quantum plans to continue selling niche products, such as specialty video editing equipment and surveillance products, and plans to develop a line of proprietary products. Wiener declined to disclose those products but notes Quantum will continue providing free technical support to its customers, another way to set itself apart from other electronics merchants. For more information on how to order the 2014 edition of Internet Retailer’s Top 500 Guide click here.